This post is written by Dillon Blankenship, one of our two Hubbard Fellows. Back in December we kept pretty busy with fence work. The barbed wire fences at a few sites needed to be repaired, and some had to be taken down and rebuilt from the beginning. Single wire electric fences were taken out altogether and will be replaced this spring to accommodate new grazing configurations. The barbed wire fences we removed were old and in bad shape. Their wire was loose and rusty; t-posts were bent over or leaning. When we acquire properties, fences are often in bad shape. This one has multiple layers and ages of barbed wire, has shrubs and trees grown into it, and needs to be removed and replaced. I am struck by how dramatically the landscape is changed by the mere removal of a fence. Despite the remaining row of interspersing trees or scraggly smooth brome, fencelessness returns a semblance of the infinite horizon. Of course, I want to see the trees and brome erased too, but these things take time and getting the old fence out of the way begins the process. Even when the next piece of land is a dusty field of corn stalks – much less imposing post-harvest- the lack of fence is liberating. I am free to view the landscape as it once was and I imagine that wildlife can more freely roam about the planet. Though it is easy to romanticize the open range, fences obviously have some utility. Barbed wire fencing is a relatively inexpensive way of delineating property boundaries. It confines one’s own livestock and/or protects crops and pasture from being damaged (by stray vehicles, your neighbor’s cattle, etc.). In our restoration work on the Platte we use fences not just to keep cattle in, but also (using single strand electric) to manipulate where and when they graze to suit our particular management objectives – such as controlling certain plant species or promoting others while maintaining a diversity of habitat types. 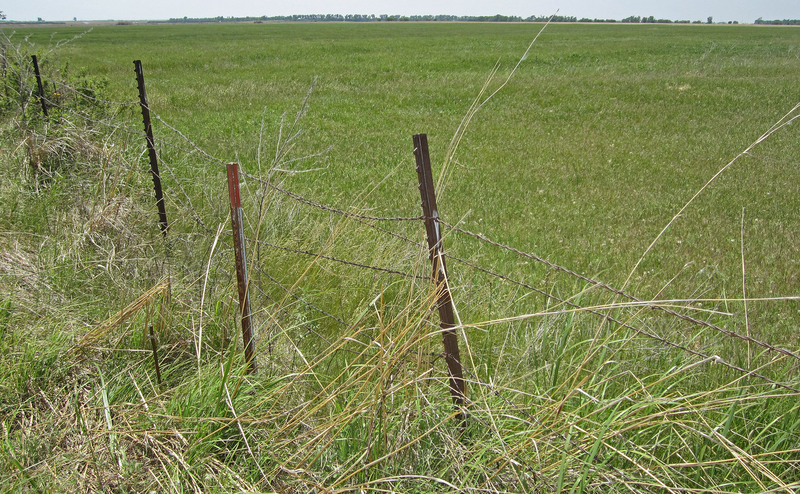 Barbed wire fence is the most common type of fence used in most pastures. It is strong and effective. It is also visually prominent, and whether or not it is attractive depends upon your point of view. Though these are compelling reasons to keep fences around, I remain frustrated by the inconveniences they create. I have already mentioned the aesthetic inconvenience. To my eye – even with agriculture playing a prominent role in the landscape mosaic – the Plains look more expansive and beautiful without fence lines. The image of an unfenced pasture is striking for its rarity. Fences can also be problematic for certain wildlife. While deer are pretty good at jumping over most fences, animals further west like bighorn sheep and pronghorn need special accommodations for safe passage. Free-roaming bison, of course, have little hope in our highly fenced world – we must confine them to their own big area saying “this is yours, but go no further.” Even birds are affected, sometimes colliding with and becoming entangled in barbed wire. Field fences, though not insurmountable, present their own challenges for ground dwelling creatures. 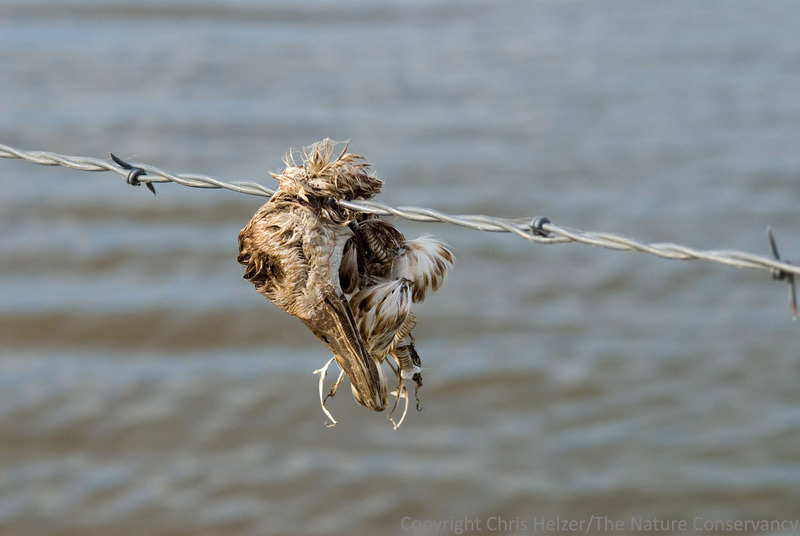 This duck got hung up and died on a fence along the edge of a wetland. My biggest complaint is that fence lines are often poorly managed. They can be difficult to work around when treating invasive species, which makes them prime habitat for encroaching trees and exotic plants. Substantial tree lines are common along fences in central Nebraska. In many cases, I suspect the fence came first. While a fence itself is usually not too problematic from a grassland habitat perspective, fences that grow up with trees begin to act as fragmenting agents – deterring grassland bird nesting and generally diminishing the openness favored by grassland species. There are already a lot of good ways to mitigate fence impacts for wildlife – increasing visibility for birds and using smooth wire with particular spacing for large mammals. Sometimes wooden fences are better alternatives, though more resource intensive (got any spare cedars?). While these address the wildlife objection, they don’t do much for the aesthetic or management elements. Single-strand, smooth wire, electric fences are simple and temporary, offering reprieve from the oppressive four-strand barriers and better accessibility for management – you can drop the wire and drive right across. Moreover, when you move these fences every year like we do, fence-line management is less of a problem because the following year any given line-site will be back in the management regime of fire, grazing, and manual treatment. This system suits my preferences well, but its greatest assets are also its ultimate downfall. Even when electrified, single wire fences are often not enough to keep cows in – and, I imagine, never keep in sheep or goats. Also, deer are pretty good at going right through, knocking the wire off the insulators – which is hard to monitor when you have a lot of wire out there. I was going to say that their temporary-ness was another drawback – a guarantee that you have to work fence every year. However, tree and exotic species management need to happen every year anyway, so maybe it wouldn’t be that much work and I feel like removing 20 years of trees from an unmaintained fence probably takes much more time than monitoring and moving temporary fences. Bison fence at The Nature Conservancy’s Broken Kettle Grasslands in Iowa. My dream of fencelessness is really thwarted at scale. 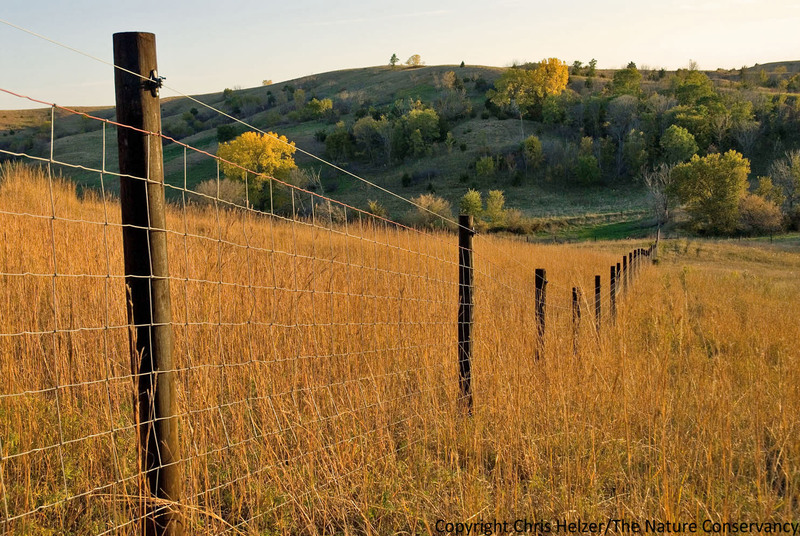 At places like TNC’s Niobrara Valley Preserve with over 50,000 acres to manage, you really just need a sturdy fence that doesn’t have to be constantly checked… or so I thought. I recently learned about innovations in fencing that have been experimented with over the last decade. I had been thinking that something like the invisible fences people use for pets might be an interesting option to scale up, but there are better systems already in play. Instead of building (or burying) an actual fence, there are folks putting GPS collars on cows and then using digital mapping software to “draw” fences on the landscape which deliver a slight shock (like an electrified fence) when cows cross the satellite-imposed boundary. These digital fences can be placed at property boundaries, around sensitive vegetation or aquatic features, and across a pasture to suit a particular grazing regime – all with the swipe of a computer cursor. It could be modified on the fly, which is even easier now that so many people are carrying smartphones (this technology is already being utilized for things like increasing center pivot irrigation efficiency via monitoring and adaptive management). Doesn’t that sound incredible? No fences breaking up the landscape (which is aesthetic, but also means less work for ranchers), safer corridors for wildlife, less potential for tree encroachment, and better accessibility for managing invasive weeds. Cool. The system is bound to have its own problems – technical glitches will happen on occasion (with the software or and the collars), there will be new opportunities for trouble-makers to tamper with private property (“digital cattle rustlers”), star-up costs, you name it – but I really like the potential something like this has for prairies and the ranching community. Nonetheless, most of us aren’t quite there yet, which brings me back to the old-fashioned fence. For now I guess I’ll have to get over it and get on to other things; just manage my own fence better and become hardened to the unavoidable taunting of unnatural tree lines and fence rows on the landscape. It feels good to vent a little bit here. As it warms up I cease writing and return to work on the post and wire repairs. I return to the prairie and reflect on these musing, “Alas, this is a necessary, if unfortunate evil” and the new fence goes up. I find solace that its days could be numbered. 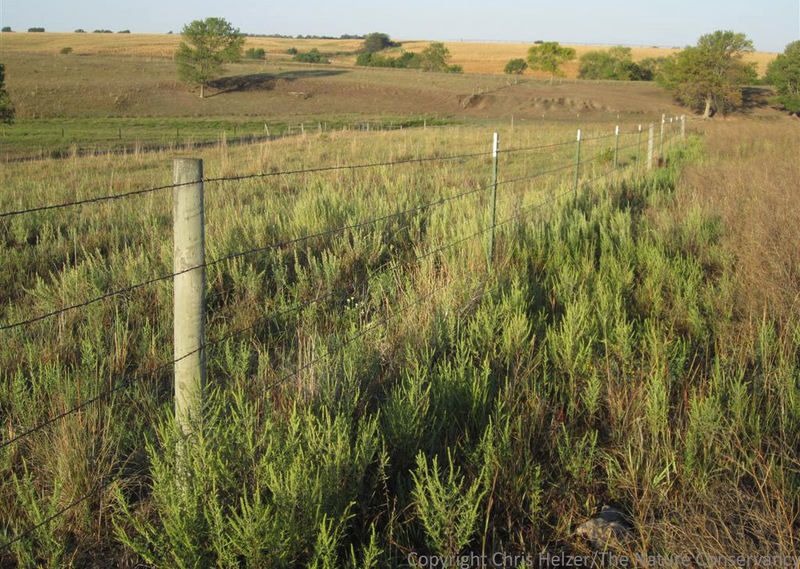 This entry was posted in Hubbard Fellowship, Prairie Management and tagged aesthetics, fence, fences, fragmentation, landscape, wildlife by Chris Helzer. Bookmark the permalink. Eloy Arizona, local farmer thought he was buying a pet buffalo to wander his fields, but buffalo decided to easily cross several FIELD FENCES to cozy up with local farm cows. He complained to farmer with cows; “come and get your buffalo” was reply. The story ended shortly with selling the buffalo , comical effort from owner bribing the cow to lead the ‘big guy’ to the trailer. Oh, then more laughs trying to restrain the ‘big guy’ in the trailer. Nice bit of writing, Dillon. Lots of thoughts about fences that I’ve had over the years, and some new ones. I have a question: Why do people even bother with barbed wire? Wouldn’t smooth wire be just as good for all imaginable humane uses, if properly “strung”? If chosen correctly, ROWs can provide a great no-treatment contrast to burned/grazed/otherwise managed private fields. Observing the differences that result can raise interesting questions and perhaps yield important insights about the potential climax vegetation community.